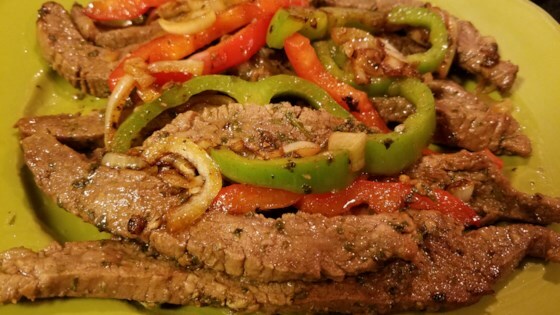 "My fajitas are finally perfected, it doesn't get any better than this! Fo' sho'! Serve in tortillas with picante sauce or salsa, sour cream, cilantro, and maybe guacamole." Whisk lime juice, cilantro, jalapeno pepper, olive oil, garlic, and cumin together in a large glass or ceramic bowl. Add skirt steak, onion, and red bell peppers; toss to evenly coat. Cover the bowl with plastic wrap, and marinate in the refrigerator, 30 minutes to 2 hours. Remove steak, onion, and peppers from marinade and shake off excess. Discard remaining marinade. Heat 1 teaspoon vegetable oil in a large skillet over high heat until oil shimmers. Cook and stir steak in hot oil until browned on all sides and still pink in the center, about 3 minutes per side. Transfer meat to a plate, tent with aluminum foil, and let rest for 5 minutes. Heat remaining oil in the same skillet over medium-high heat. Saute onion and peppers in hot oil until just tender but still crisp to the bite, 5 to 6 minutes. Return meat to skillet; cook and stir until heated through. You can use any color bell peppers in place of the red bell peppers, if desired. You can use flank steak, carne asada, or chicken in place of the skirt steak, if desired. Perfect chicken fajitas! The lime juice was not too strong at all. We added some chopped pineapple at the end and had a fabulous meal. This was a good recipe for fajitas. Along with steak, I used prawns and it turned out well too. Perfect fajitas. With sour cream and shredded cheese, this is amazing! This is wonderful...my only change is that I used all jalapenos and poblanos because we like it a little spicy! Great recipe! This recipe have three of my favorite things,beef fast and easy.It's great for that after work meal when you just don't feel like cooking.